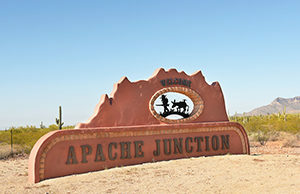 Apache Junction, Arizona is located at the base of the Superstition Mountains about 35 miles east of Phoenix. Incorporated in 1978 it has a current population of approximately 40,000 people. This entry was posted in Geographic, Phoenix, RV, Storage on November 7, 2017 by George W.